With Japan’s adoption of many cultural trademarks of China – bonsai was also taken up, introduced to Japan during the Kamakura period (1185 – 1333) by means of Zen Buddhism – which at this time was rapidly spreading around Asia. The exact time is debatable, although it is possible that it had arrived in AD 1195 as there appears to be a reference to it in a Japanese scroll attributed to that period. Once bonsai was introduced into Japan, the art was refined to an extent not yet approached in China. Over time, the simple trees were not just confined to the Buddhist monks and their monasteries, but also later were introduced to be representative of the aristocracy – a symbol of prestige and honour. The ideals and philosophy of bonsai were greatly changed over the years. For the Japanese, bonsai represents a fusion of strong ancient beliefs with the Eastern philosophies of the harmony between man, the soul and nature. Bonsai were brought indoors for display at special times by the ‘Japanese elite’ and became an important part of Japanese life by being displayed on specially designed shelves. These complex plants were no longer permanently reserved for outdoor display, although the practices of training and pruning did not develop until later – the small trees at this time still being taken from the wild. In the 17th and 18th century, the Japanese arts reached their peak and were regarded very highly. Bonsai again evolved to a much higher understanding and refinement of nature – although the containers used seemed to be slightly deeper than those used today. 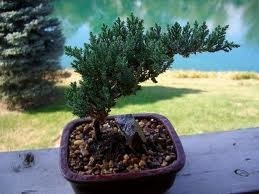 The main factor in maintaining bonsai was now the removal of all but the most important parts of the plant. The reduction of everything just to the essential elements and ultimate refinement was very symbolic of the Japanese philosophy of this time – shown by the very simple Japanese gardens such as those in the famous temple –Roan-ji. At around this time, bonsai also became commonplace to the general Japanese public – which greatly increased demand for the small trees collected from the wild and firmly established the artform within the culture and traditions of the country. Over time, bonsai began to take on different styles, each which varied immensely from one another. Bonsai artists gradually looked into introducing other culturally important elements in their bonsai plantings such as rocks, supplementary and accent plants, and even small buildings and people which itself is known as the art ofbon-kei. They also looked at reproducing miniature landscapes in nature – known as sai-kei which further investigated the diverse range of artistic possibilities for bonsai. Finally, in the mid-19th century, after more than 230 years of global isolation, Japan opened itself up to the rest of the world. Word soon spread from travelers who visited Japan of the miniature trees in ceramic containers which mimicked aged, mature, tall trees in nature. Further exhibitions in London, Vienna and Paris in the latter part of the century – especially the Paris World Exhibition in 1900 opened the world’s eyes up to bonsai. Due to this phenomenal upsurge in the demand for bonsai, the now widely expanding industry and lack of naturally-forming, stunted plants led to the commercial production of bonsai by artists through training young plants to grow to look like bonsai. Several basic styles were adopted, and artists made use of wire, bamboo skewers and growing techniques to do this – allowing the art to evolve even further. The Japanese learnt to capitalize on the interest in this artform very quickly – opening up nurseries dedicated solely to grow, train and then export bonsai trees. Different plants were now being used to cater for worldwide climates and to produce neater foliage and more suitable growth habits. 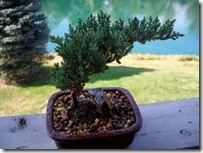 Bonsai techniques such as raising trees from seed or cuttings and the styling and grafting of unusual, different or tender material onto hardy root stock were further developed. Bonsai has now evolved to reflect changing tastes and times – with a great variety of countries, cultures and conditions in which it is now practiced. In Japan today, bonsai are highly regared as a symbol of their culture and ideals. The New Year is not complete unless the tokonoma – the special niche in every Japanese home used for the display of ornaments and prized possessions – is filled with a blossoming apricot or plum tree. Bonsai is no longer reserved for the upper-class, but is a joy shared by executive and factory worker alike. The Japanese tend to focus on using native species for their bonsai – namely pines, azaleas and maples (regarded as the traditional bonsai plants). In other countries however, people are more open to opinion. The evolution of bonsai over the past two centuries is truly amazing – now a well known and respected horticultural artform that has spread throughout the world from Greenland to the U.S. to South Africa to Australia. It is constantly changing and reaching even greater heights, representative of how small the world is really getting.